Find the cheapest gasoline prices near you. 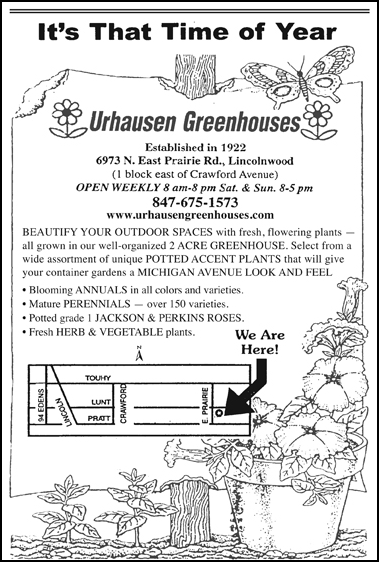 Nick and Gerard Urhausen are of the newest generation of this well-known family that have been the providers of garden plants and flowers to the Chicagoland area since 1922. When Gerard & Nick's grandfather and his brother started their life's work decades ago, the Lincolnwood property they continue to occupy was pure prairie land with no trees and only a scattering of houses - most of them summer residences. What is now Lincolnwood was all "Country." Vegetables were the mainstay of the greenhouse back then, with all the members of the Urhausen clan chipping in to help during this seasonally busy business. In fact, even today, this is still a total commitment by the entire family. "It seems like you can never work hard enough," Nick and Gerard comment. "Even in the off-season we're making ready for the next year. Because we grow everything ourselves, we offer more colors and varieties including hard to find blooms like zinnias and cosmos. We are really growers more than we are your typical plant and flower providers. As a result of that we are not merchants or marketeers. Our experience and training is as greenhouse growers." For years now, people from far and wide have been making the "outing or excursion" as it was in the early days, to only a quick trip on any of the major roadways today to feast on the "conservatory" atmosphere of Urhausen's Greenhouse, where they can stroll among the living world of beauty the Urhausen's provide. And then to be able to take some of that beauty home with them and enjoy their choices for months afterwards is the ultimate treat. Gerard and Nick add, "We appreciate all of our customers and the support they have given us through the years and always try to make their experience with us an enjoyable one. Our patrons love to be able to shop in a place where their future plants are actually growing." We at Our Village thank the Urhausen family for all the service and beauty they have shared with us through these many years and are pleased to announce they will be doing an article for us on a regular basis in which they will continue to share their expertise with us. Chicagoland Hobby, Inc., a family owned business, was purchased in 1973 by Richard Bosak. At that time, the store was located at 22 West Madison Street in downtown Chicago in the Subway Arcade. In 1982, the business was moved to the First National Bank Building, and in 1984 set up its current, and permanent location in Norwood Park. Richard Bosak retired in 1992 and passed the baton over to his son, Greg, who now heads up this thriving, ever-changing and growing concern. Greg and his staff carry on the traditions laid by his father, and those before him, and maintain the practice of combining skill and knowledge in the many facets of this complicated, detailed industry. Chicagoland Hobby has a full stock of kites, gliders, telescopes, microscopes, puzzles, rockets, die-cast autos (including slot cars), and R.C. airplanes, cars, boats and helicopters. They also have one of the most complete lines, in the city, for those whose interest lies in trains, a very involved collector's hobby. In fact, they not only sell all scales of trains, but they buy them as well. The accessory line, which is essential to the hobbyist, such as brushes, paints, tools, balsa wood, books and DVD's on various subjects, are always available. The store is also an official Boy Scout and Girl Scout distributor, and has a "Pinewood Derby Track" (soap box) in the store that may be rented for the purpose of races. Chicagoland Hobby is an adventure just to visit and browse through and children of "all ages" are encouraged to stop by anytime to get to know Greg and his staff and discover the adventure of the world of hobbies and meet people who are not only experienced in the field but who will also help with your needs in a very friendly, relaxed manner. 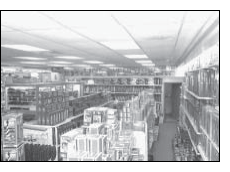 Chicagoland Hobby, Inc. is located at 6017 N. Northwest Highway in Norwood Park, and may be reached at 773-775- 4848. You also will want to check out their website at www.chicagoland-hobby.com. 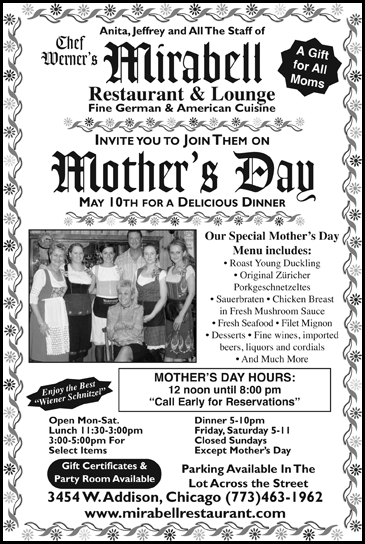 They are open from 11:00 am - 7:00 pm, Monday through Thursday; 11:00 am - 8:30 pm Friday; 10:00 am - 5:00 pm Saturday. All content copyright ©2008 by Our Village. No unauthorized reproduction of any content of this site may be done without permission from Our Village.